Take 1 tablet 1 to 2 times daily with a meal. Do not take before bedtime. As the sensitivity to the activity of caffeine is an individual matter, it is recommended to start supplementation with the lowest recommended dosage. Using too high doses can cause gastric problems, which stem from the irritating activity of caffeine. 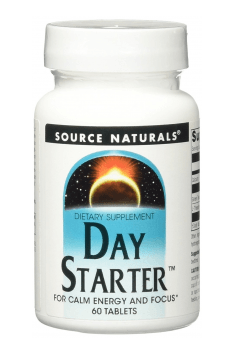 Because of the stimulant effect of caffeine, it is not recommended to use the supplement Day Starter later than 4 hours before sleep. Keep away from children.